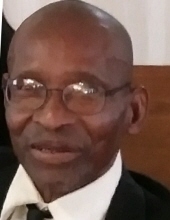 ...age 76, a native of Warren County, GA, formerly of Thomson, GA, passed away on Sunday, March 24, 2019 at the Warrenton Health and Rehabilitation Center, Warrenton, GA. Relatives and friends may call at his sister's residence, Lizzie Walker, 918 Aelise Street, Thomson, GA. Thomson Funeral System, 505 Gordon Street NE, Thomson, GA is in charge of all arrangements. To send flowers or a remembrance gift to the family of Joseph Jackson, please visit our Tribute Store. Or, if you would like to donate to the family, please visit Joseph's Tribute Fund. Service will be incorporated with the Sunday morning service. Help ease the financial burden placed on the Jackson Family after the loss of a loved one by making a donation. "Email Address" would like to share the life celebration of Joseph Jackson. Click on the "link" to go to share a favorite memory or leave a condolence message for the family. Provide comfort by sending fresh flowers from our local florist or donating to Joseph's Tribute Fund.